Flat plastic washers are used in a myriad of applications ranging across all industries. Broadly we find the product acting generally in one of three functions: Sealing, spacing, or bearing. The material choice is dependent on the application needs. Sealing: A common use is to seal gases and fluids with flat plastic washers for seals in pumps, valves, dispensers, batteries, plumbing, pool and spa, automotive, fire extinguishers, food handling, fuel injectors, compressors, boilers, beverage dispensing, etc. For these applications the critical need is environmental resistance to the fluid be used at the operating temperature. 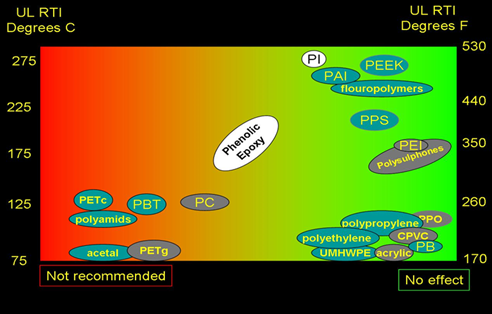 Below is how various plastic materials perform in hydrocarbon environment. You will see that crystalline materials generally do better than amorphous plastics. 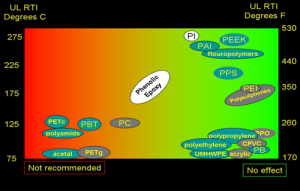 On the other hand plastics that don’t resist grease and oil may perform better than many crystalline materials in acidic or basic aqueous environments. Polypropylene handles the hot acid of a car battery in under hood conditions that would dissolve nylon. 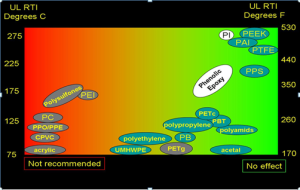 Likewise Acetal can perform in fuel system, but would fall apart in hot ethylene glycol where polyethylene is far superior. So for sealing it is an issue of studying the chemical resistance and temperature capability of various materials in the environment of interest. Spacers: A very large amount of plastic washers are used as spacers to electrically insulate, distribute fastener loads, reduce vibration, or keep metal from metal contact in markets such as tools, seat belts, parachutes, medical prosthetics, doors, shutters, windows, walls and hardware, hinges and shims to name a few. The materials may have some amount of wear resistance required, or low friction. However in general it is simply the compressive requirement of the application at temperature that become the deciding characteristic. Of course one should also consider if the washer will see sunlight, as most plastics have poor weathering resistance unless modified to handle such environments. If weathering is a concern radiation resistant plastics like PVDF or Ultem poyether imide are good choices, or acrylic if there is little requirement for chemicals, heat, or strength. 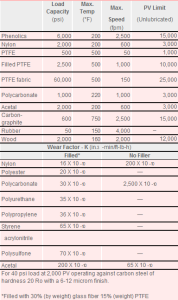 As can be seen in the table below, PV limits are heavily affected by composition. 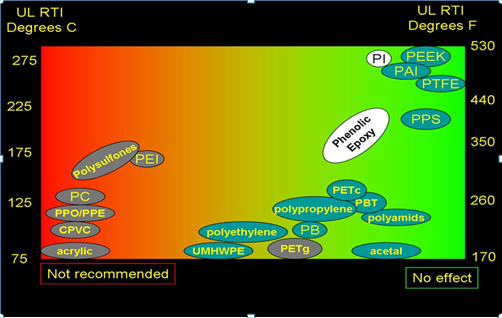 Adding glass fiber to PTFE increases it PV limit be a factor of 10. 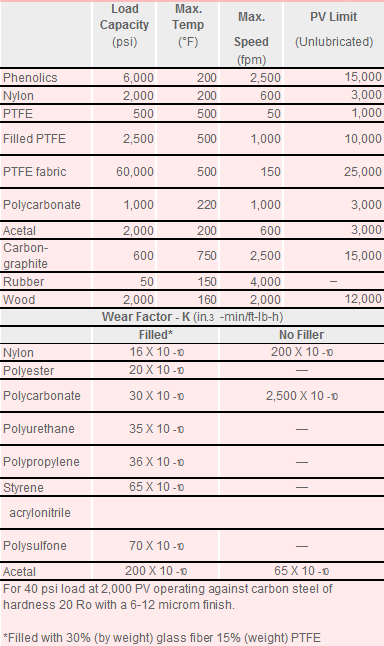 The temperature range and PV limits are shown below for several other materials we maintain in inventory for use in these types of applications.